The Kill Order is the story of that fall. A prequel to the Maze Runner trilogy, The Kill Order has been in the works since the completion of The Maze Runner. The story of civilization's fall was kept under wraps and is the explication of the events that began this bestselling series. 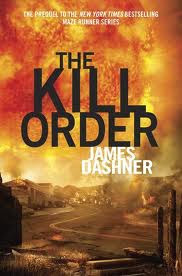 The Kill Order is a one-off prequel to The Maze Runner series, which is a series that I loved. I was a little hesitant to let myself like this book, as I didn't want to come to know a new set of characters in the same written world, and because of that, it took me a good third of the book to really, really get into it. But once I was in, I was all-in. What a ride! What a terrifying, horrific, brutal ride! From the get-go, you expect a rather bleak horizon and morbid outcome for most of the characters featured, given the world set up in The Maze Runner series; a world in which "the good guys" (WICKED) really have no moral compass. The Kill Order certainly does a good job of explaining how on earth an organization such as WICKED could come to be. And because this book is so very good at it's job, it is different than it's predecessors in the way that it reads and the basic makeup of the story's goals. I really wouldn't classify this book as being appropriate for younger teens. Without proper digestion and guidance, this is the type of book that could inspire acts of violence. Overall, really well done. BUT, parents, approach with caution, read this before your kids do, and if you deem it appropriate, be prepared to have conversations about the violent situations in this story in order to help them to understand the correctness (or incorrectness) of the things that happen in this book. Thanks for the review. I'm really wanting to read this. The Maze Runner is an excellent series, more mature than the Hunger Games, in my opinion. Dashner is consistently excellent in his writing the whole way through the series. Am SO looking forward to reading this.